Also referred to as ENFP, ENTP, ENxP, ENP, or Extroverted Intuitive personality. The extraverted intuitive personality type for kids grows up into an ENTP and ENFP adult. They are motivated by creative inspiration and seem to be curious about everything. They have lots of ideas and love to dream up products and services to solve problems, then work to turn their dreams into reality. ENP personality types abhor routine details and maintenance and truly do “march to the beat of their own drummer”—with their own pace and schedule. They love fun, challenging and varied environments that reward their natural enthusiasm and imagination. They love to meet new people and learn new skills and relish the freedom to follow their hearts and dreams on what they perceive to be exciting adventures. Natural leaders, kids with extraverted intuitive personality types are simultaneously social and independent and will resist following. They are high energy with a strong desire to be the center of attention and have a tendency to be dramatic. This outspoken energy can lead them to finish other’s sentences or even interrupt frequently. Kids with an ENP personality type often have fearless beliefs that anything is possible coupled with exceptional vocabulary, communication skills and persuasive nature make them natural debaters. Kids with an Extraverted Intuitive personality type like to be busy and need lots of stimulation. They don’t do well following traditional rules and often need to feel truly “inspired” to become an active contributor in a class. They work best with and around others, but can be easily distracted and can have trouble finishing projects that they have begun. As a parent, this is a great personality type to enroll in a wide variety of classes. Do not get too frustrated if your child decides they no longer want to take piano, but instead want to try their hand at golf. It’s best not to invest a lot of money in “the best” instruments or equipment, since kids with an ENP personality type will most likely want to dabble in almost anything your community has to offer. Musical children with ENTP or ENFP personality types will do well learning an instrument in a group or individually, because their outgoing natures give them the ability to play in a band with other musicians, and they have no problem performing either solos or in a group, in front of an audience. This said, one of the most valuable gifts that can be taught to ENP personality types is how to narrow their focus. (Something that ENFP and ENTP adults can attest to!) These kids learn best by understanding the theory behind the practical application and then are left alone to achieve it in their own way. Innate boundary pushers, overarching rules need to be firmly defined for the children with ENP personality types. They will push repeatedly for what they want unless they understand the reasons WHY the teacher has requested it. They love praise and garner much of their self-esteem from their ability to do things well. Instructors that show interest in their ideas and projects but let them find their own way to achieve the goal are the best fit for these children. 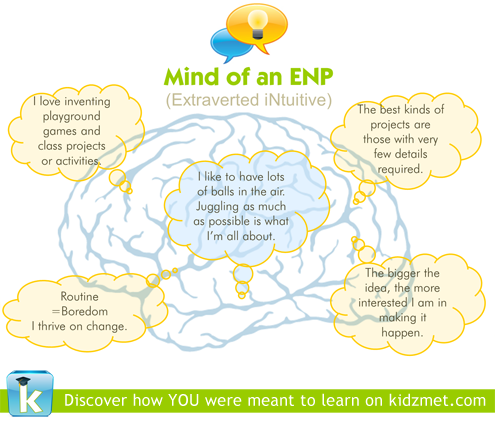 Learn even more about how your Extroverted Intuitive is uniquely wired to learn as a Kidzmet member.